This trip had been in the works since I purchased my Cebu Pacific PHP1 tickets. It's day 1 of my birthday trip to Palawan. The last time I was in Puerto Princesa was in 1997, exactly ten years ago. At the Manila Domestic Airport Terminal (I hope they replace this ageing airport soon), the line for the flight to Puerto Princesa was quite long already. Then I noticed an Express Counter for passengers without check-in luggage. I usually travel with my backpack only and it was just now that I noticed that counter. Anyway, there was no line so I got my boarding pass easily. When I arrived in Puerto Princesa, I was picked up at the airport by the staff of Puerto Pension. I had asked the help of the DOT Regional Office to help me find a decent budget hotel. And from the list they sent me, I decided to stay there since they were the cheapest on the list, had airport transfers, free breakfast, and accepted credit cards. When I arrived in the hotel, I found out they also booked tours for you. So I decided to join the City Tour (PHP600) in the afternoon, the Honda Bay Island-hopping Tour (PHP1000) the next day, and the Underground River Tour (PHP1300) on Saturday. Lunch was included in the last two tours. The van passed by for me at 1:30 p.m. 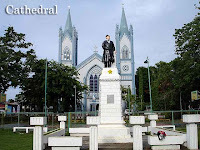 The group first passed by the Plaza Cuartel and the Immaculate Conception Cathedral before proceeding to the Palawan Museum. The exhibits were what one would expect from a provincial government museum. I hope they get rid of these boring ways of presenting important artifacts by investing in world-class exhibits such as that of the National Museum in Manila. From there, we proceeded to the Butterfly Garden, a great place to view butterflies up close. After a short walk inside, we were off to the Crocodile Farming Institute, now the Palawan Wildlife Rescue and Conservation Center since the place not only conserved crocodile species. 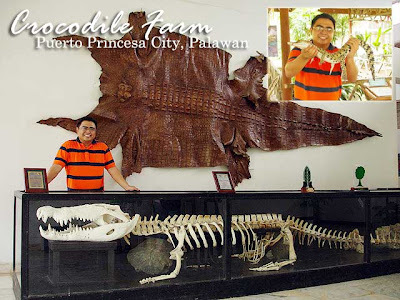 Displayed in the main lobby of the center is the skeleton of the longest crocodile ever caught in Palawan, about six meters, although a nine-meter croc had been spotted after it fed on a child but was not caught. When this croc died, they opened up its stomach and found the remains of a person inside confirming what had previously been known. We also walked around tanks of baby crocs which the center breeds for leather production. At the back is a mini-zoo which features some species endemic to Palawan. 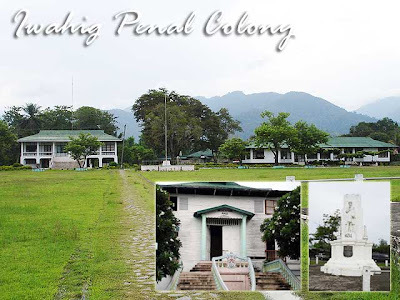 Next on the list was the Iwahig Prison and Penal Farm, the only prison in the country without walls, where inmates are rehabilitated through productive and money-making activities such as farming and handicraft-making. 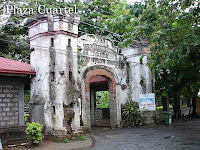 Opened in 1904, this was among the first major projects of the American colonizers in the island of Palawan. They had been looking for a place to exile “unwanted” persons that included prisoners and lepers. And both groups were sent to Palawan, the latter being sent to the Culion Leper Colony. We made a brief stopover at Mitra Ranch, the home of former Speaker Ramon Mitra, Jr. which has been opened to visitors, before making our way back to the downtown area. But we stopped by this place called Baker’s Hill which is known for its breads and hopia. 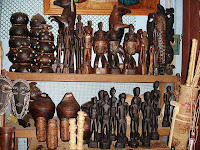 In the town proper, I bought some souvenirs in the market. 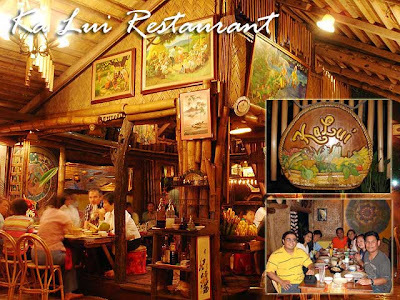 Then it was dinner with my tour group in the highly-recommended, by-reservation only Ka Lui Restaurant. In fact, we could not get a booking earlier than 8:30 p.m. You can ask your hotel to book for you. Our city tour group clicked especially since we found out we had booked the same tours for the next two days. Thanks to Rolly & Gigi Padilla from San Francisco, CA for the dinner. It was a coincidence that Linda is an avid reader of my blog. So she insisted that she treat me out. Thanks again! And to the rest of the gang, Em de Guzman, Rommel Cruz, and Richard & Agnes Cordero, thanks for the company! Back to Ka Lui, I did not expect what I saw. It was a very cozy place, full of paintings, décor and other artsy stuff. The whole place was almost made of bamboo. Customers had to take off their shoes at the entrance and walked barefoot in the restaurant. It was an all-seafood menu which included shrimps halabos, seafood sisig, kilawin, and crabs, eel or sting ray in coco cream among many others. Among their cool shakes are CocoBanana and Mango Pomelo. Although I’m a meat person, I enjoyed the seafood sisig and stuffed squid. We enjoyed the place so much, we stayed until it closed at 11 p.m. There are more photos in my Multiply. Hi Ivan! I'm a long-time reader, first time poster. First off, belated happy birthday! It's great you were able to spend it in such a beautiful place. Ask ko lang, did you hire a tour guide or avail a tour package in Puerto Princessa or it's purely DIY? I'm planning for a trip to PP, but I'm uncertain whether to just wing it or arrange for a guide/package before I leave Manila. 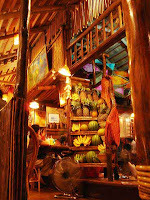 Hi Nina, the good thing about Puerto Princesa is there are package tours available, and they charge per head. So even if you go alone, the cost would be the same. You can easily arrange a tour from your hotel and they will be the one to book you with reputable tour organizers there. a-ha! so ito pala ang pa-birthday mo sa sarili mo ivan ;p i lala-love palawan. mas magandang pumunta diyan if you have someone special with you, yikeee. hehe. as usual, career na naman ang photos. parang pang-postcard, so ivan! hihi. glad you had fun! haburday ulet. Haha! Maraming salamat sa Cebu Pacific P1 fare, masaya ang birthday ko! Hahaha! so you been in palawan...you take the package tour, you must have missed Dang Maria's, Neva's their great pizza... anyway you experience naman ka lui eh..
Can I camp in one of the Islands in Honday Bay (Snake, Pandan or Starfish Islands) ? hi ivan, how much is the latest rate per person of the underground river tour package now? im planning to go to palawan this march 25 till 27, 2011 with my friend and her bf. and it's a must for me to check out ur blog first b4 i decide on my tineraries, lol..thanks for the informative and helpful tips here. appreciated it very much,thanks again.. I saw a website that mentioned that it only cost 700 pesos for a boat which is good for 6 persons. Its too expensive if you get it from the agency. You can experience the underground river w/o hurting your pockets. Yeah, then you rent a van to get there. Again, if you are alone or with a small group, the tour will come out cheaper. Plus they do the lining up for you. Siquijor: DPWH stupidity strikes again!